Check out our gems that real brides and their maids sport on the big day. This wedding was particularly special for our family for so many reasons. One of them was that this sweet little flower girl belongs to us. And she is in love with Maddy and Sam and was thrilled when they asked her to be a part of their big day. Not to mention she got to walk down the aisle with his handsome little man. Congratulations dear friends! We could not be happier for you! One of my very favorite parts of the process is being invited in to special moments, such as this. It was so fun when Casey came to me with this custom request. 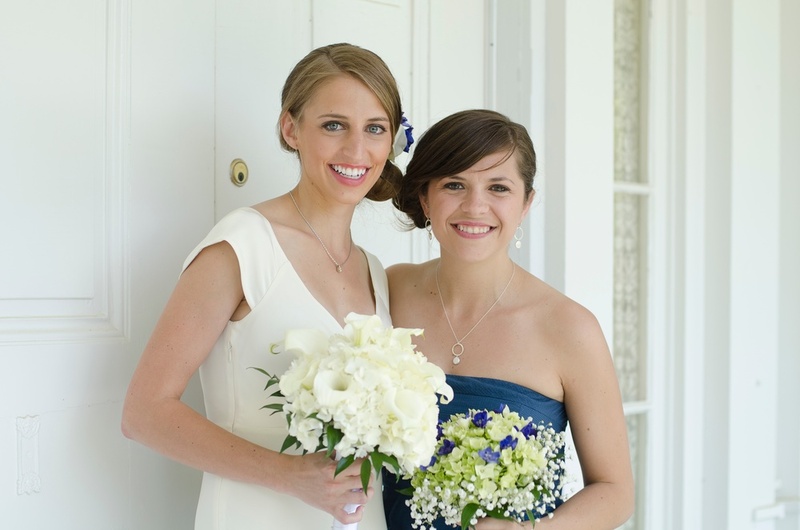 She wanted to take one of her mother's pearl earrings (that her mother had worn on her wedding day, and that Casey had lost the match for at a high school track meet) and make it into a necklace that she would in turn surprise her mother with on her wedding day. I love how this simple and elegant pearl necklace turned out so much, that I made it a part of my line! You can also find it in 14K gold fill here. Casey, thank you for privilege of being a part of this beautiful day! Out West • Bride: Moss aquamarine + pyrite earrings • Bridesmaids: Labradorite earrings • Featured on Style Me Pretty • Photography: Duenas Photography. Bride: Freshwater pearl brooch • Bridesmaids: Freshwater pearl, aquamarine + amethyst earrings + bracelets. Fall at the Clifton Inn • Bridesmaids: Green onyx, amazonite, aquamarine + amethyst earrings.